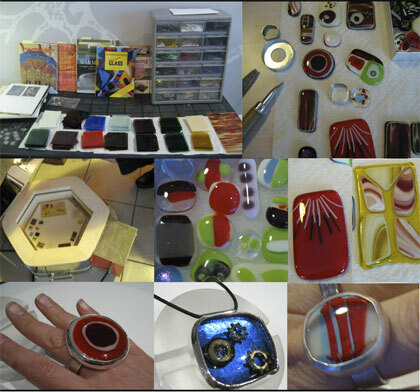 Glass Fusing components for jewelry, and wearable art plus, making a ring band and bezel-setting glass! New workshop dates have been added for May, June and July- interested? Check it out here. Casting glass uses the Lost Wax process– which is very similar to Lost wax casting metal. Work with beautiful transparent Gaffer crystal, and Bullseye glass! Glass casting workshop July, 25th start/intro 6:30-9:30pm then Saturday & Sunday July 26/27 and Sat/Sun August 2/3 10am to 5pm 5 Student max., 3 student min. $180pp + $200 lab & materials fee** Glass casting workshop (small to medium scale objects) Learn the basics of glass casting. Up-cycle your wine or beer bottles into a beautiful work of art! Students will learn how to make molds of existing objects using Alginate, as well as model new ones from clay and wax. No experience necessary! Focus on beginning mandrel wound glass beads. Working with beautiful Italian, Chinese and German hand-pulled glass students create beads, and rings. History is discussed, glass formulas, annealing cycles, glass suppliers/makers, and more! Create your own glass beads. All materials included*! No experience necessary! *Each student receives a special glass kit. nanopod: Hybrid Studio is Toronto’s artist run, metal + glass studio offering workshops and courses in metal fabrication, lost wax casting (metal and/or glass), fusing, flame-working, stone setting, working with vitreous enamel, and more!